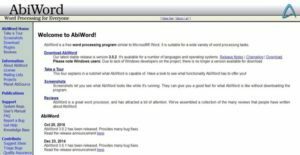 AbiWord is a free and open source word processing tool designed and developed by a group of volunteers around the world to handle a wide variety of word processing tasks. Supporting multiple languages and operating systems, AbiWord is a component of a larger project known as AbiSource, an open source project that was initiated by SourceGear Corporation and aimed at developing a cross-platform office suite. AbiWord is considered as a unique word processor because of its capability to be easily deployed and run on various operating systems and platforms. Also, its powerful support for internationalization makes it a tool that has a massive user-base. The word processor can be used for work-related word processing tasks, personal needs, and fun typing activities. AbiWord delivers basic features similar to those of Microsoft Word. What makes AbiWord a unique tool is that it is a fully cross-platform word processing program. Thus, users will be able to run it virtually on any operating system without the need to spend much time on porting. They can install and run the program on the operating system of their choice; whether its Windows, Linux, QNX, FreeBSD, or Solaris. As the program integrates with the operating system it runs on, it utilizes the functionalities of such system. For instance, it can take advantage of the image loading or printing functionalities of a particular operating system. Aside from being a fully cross-platform word processor, AbiWord has a high interoperability. It is designed to handle different types of documents such as OpenOffice.org, Microsoft, and WordPerfect documents. It can also be used for creating Rich Text Format documents as well as HTML web pages. This capability enhances team collaboration, as users can quickly produce and share documents needed by their team members. AbiWord helps users create documents that have beautiful and professional layouts. Through the aid of its advanced document layout options, they can produce documents that are formatted and customized for professional use, scientific research, and other purposes. They can enhance their documents by adding tables, creating lists; applying bullets, footnotes, endnotes, and various styles so that they will look good and fun to read. Another powerful feature present in AbiWord is its capability to support multiple languages. The program is available in most common languages. It also supports a lot of languages that are not commonly used. It has a built-in spell checker that checks texts and documents against international dictionaries. As a result, spelling errors are quickly identified, even those ones that are often overlooked. AbiWord offers mail merge capabilities which enable users to automatically create thousands of form letters in less time. They can instantly replace the data they previously entered on special fields within document templates and fill out those templates with data from multiple sources which include relational databases, comma separated text files, and tabbed text files. In addition, the program has a powerful command line that interfaces with it; allowing users to create form letters, print documents, as well as convert documents to any type of file format from the command line. To wrap it up, the word processing tool comes with an extensible plugin system which permits users to extend its functionalities to third-party systems even to those systems which are no longer considered as state of the art. It has a set of plugins which can be used for importing documents and images, and summarizing texts. If you are considering AbiWord it may also be a good idea to investigate other subcategories of Best Office Software gathered in our base of SaaS software reviews. Since each enterprise has unique business wants, it is sensible for them to refrain from looking for a one-size-fits-all faultless software application. Needless to say, it would be futile to try to find such a platform even among widely used software applications. The smart thing to do would be to catalog the various vital factors that require consideration such as main features, finances, skill levels of workers, company size etc. Then, you should do your groundwork thoroughly. Read some AbiWord reviews and look into each of the other systems in your shortlist in detail. Such in-depth homework can make certain you reject ill-fitting platforms and choose the system that offers all the aspects you need for business success. How Much Does AbiWord Cost? We realize that when you make a decision to buy Office Software it’s important not only to see how experts evaluate it in their reviews, but also to find out if the real people and companies that buy it are actually satisfied with the product. That’s why we’ve created our behavior-based Customer Satisfaction Algorithm™ that gathers customer reviews, comments and AbiWord reviews across a wide range of social media sites. The data is then presented in an easy to digest form showing how many people had positive and negative experience with AbiWord. With that information at hand you should be equipped to make an informed buying decision that you won’t regret. What are AbiWord pricing details? What integrations are available for AbiWord? If you need more information about AbiWord or you simply have a question let us know what you need and we’ll forward your request directly to the vendor.